Monument in Section O of Mt. Hope Cemetery. These burial records came from a register that is in the Rare Books and Manuscripts Department of Rush Rhees Library at the University of Rochester (U. of R. volume #13). This register and many others were given to U. of R. in by Hillside Children's Center (the current name of the organization). 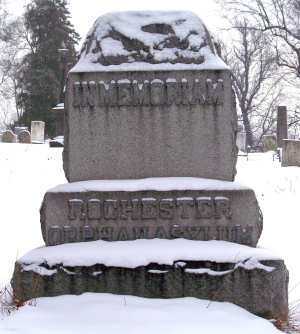 The Rochester Orphan Asylum began in 1837 with just 9 orphans in residence. The 1850 census shows that there are about 75 children living at the orphanage. It is a sad fact that even with good care that the diseases of the 19th century would take their toll. These records show those children that died at the Asylum. Compiled from a careful search of the records of the Institution, and of the Mt. Hope Burial Registers for a period of thirty two years. The graves are numbered – the first row beginning at the the north and numbering to the south – the second row numbering back to the north. The numbers and names in the book correspond with the graves on the lot. Names not numbered in the book, are those of children who have died at the Asylum but are not buried on the Asylum lot. The register was added to after 1873 and used until 1905. Note that there are five rows of graves in the ROA lot that is located in Section O of Mt. Hope Cemetery. There was a horrible fire at the Asylum on 8 Jan. 1901. Twenty-eight children and three employees died in the fire and few other children were injured. Buried places of those that died are at the bottom of this page. To read more about the fire and those that were injured read this issue of Hear Ye, Hear Ye on the Rochester Genealogical Society website. That article also tells the names of all the rest of the orphans living at the Asylum in 1901. Do not assume that just because the children were in the Asylum that both parents had died. More often, a single parent had died and the other parent put them into the Asylum to be cared for. Second Row of Graves — Commencing at the South. 64 Buckley, James Dec. 5, 1872 2½ yrs. Poisoned by Candanum which he took during the temporary absence. 4 Smith, Ida Aug.. 28, 1877 18 mo. 23 Nesser, John (headstone) Dec. 4, 1883 3½ yrs. Heminatisis ? 24 Black, Joseph Dec. 17, 1883 2 mo. Consumption of the Bowels ? 41 Felsinger, Adolphus May 6, 1885 4 mo. Buried in the same casket with her mother who died in a few hours after her baby. Fourth Row beginning at the South. 15 "Bobby" Oct.. 16, 1887 8 weeks Apparently starved and drugged to death; brought to us in a dying condition from the notorious McDonald "baby farm"
16 "Smithy" Oct.. 17, 1887 3 mos. Apparently starved and drugged to death; brought to us in a dying condition from the notorious McDonald "baby farm"
Greece Schutte, Lewis Dec. 1888 7 mos. Typhoid Tuberculous, contracted from his mother. Died at City Hospital. Private Snow, Norman July 30, 1890 17 mos. Died at City Hospital after a surgical operation on the foot. Private Deacoul, Samuel Aug.. 28, 1896 5 mos.